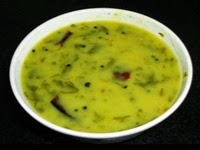 Collection of veg curries or gravies recipes - Simple veg curries, dal, sambar, kootu, huli, saaru, kadhi are staple food in both North India and South India. 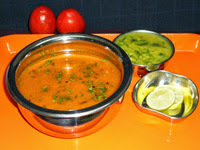 These curries are served with rice, idli, dosa, uttappam and paratha. 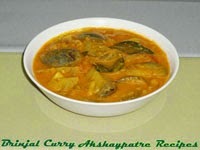 Making curries for day to day meal is very common in Indian homes. 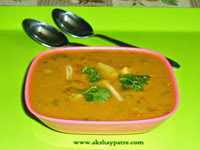 These gravies are made with mixed vegetables or simple single vegetables. 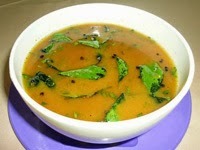 Sambar masala powder is used to make sambar and it is very flavourful and spicy. 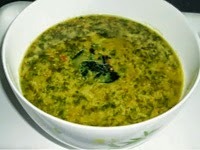 Coconut based curries are prepared using fresh or frozen coconut and other ingredients such as coriander seeds, ginger, garlic, chilli powder and turmeric powder. 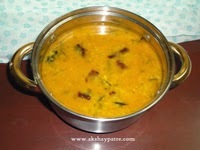 Tempering for curries usually prepared with oil, mustard seeds, asafoetida, cumin seeds, dry red chillies and curry leaves. 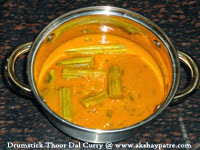 Drumstick Dal Curry - A curry made with drumstick and toor dal is a great accompaniment for hot rice. 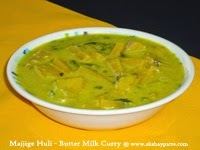 This curry is simply adorable with the combination of coconut. 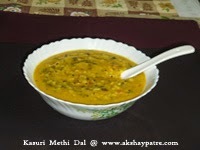 Kasuri Methi Dal - This totally guilt free dal is a great accompaniment for hot rice along with vegetable subzis, chutney powder with curds, pickles and papad as side dishes. 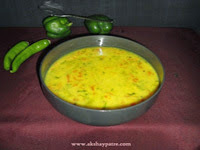 Dal Curry with White Masala - This dal curry with hot rice, makes a delicious meal with papad and pickles.The masala is called white masala because the ground masala looks white in colour. 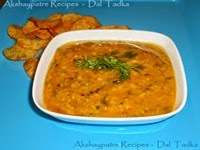 Moong Dal Amti - Amti is the Maharashtra's authentic curry. 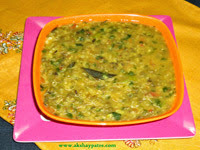 Various amtis such as katachi amti, toor dal amti, urad dal amti, mixed dal amti are very popular. 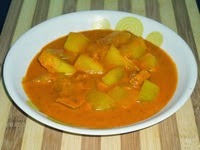 Kala masala is an authentic spice powder of Maharashtra which is very flavorful and used to make amtis. 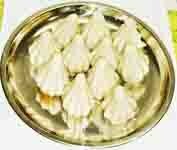 Soya Beans White Gourd Kootu - For hot rice, kootu is the queen of curries. 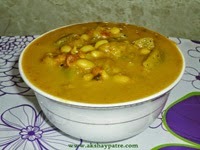 The reason for using soya bean is for it's rich protein, which with hot rice is a complete meal in itself. 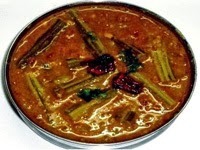 Besides dal, sambar, saaru, palya and amti, kootu is another kind of curry for steamed rice. 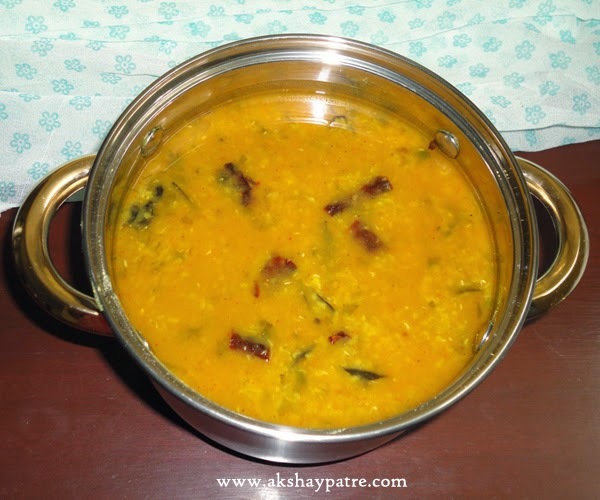 Rajma - Brinjal -Potato Kootu - Kootu is a curry which goes great with hot steamed rice. 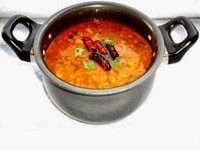 Along with dry rajma or fresh rajma, using vegetables such as brinjal, potato and cauliflower makes it more healthy and tasty.